Meadows is a mature development, completed in 2007, off Sheikh Zayed Road close to Dubai Marina, Jumeirah Lake Towers, Jumeirah Islands and Jumeirah Park. 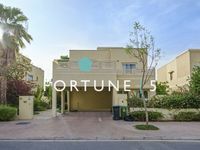 The development is conveniently close to some of Dubai’s key business locations, such as Dubai Internet City, Dubai Media City, Knowledge Village and Dubai Marina. The development is part of Emaar's Emirates Living master-development which consists of nine individual communities such as Emirates Hills, Springs, The Lakes, The Greens and The Views. It is a mature development, which means that there is no construction activity or even any planned construction activity in the future. The aptly named Meadows feature beautiful landscapes full of lush greenery, numerous lakes and water features, several parks and wide, tree-lined streets. Meadows is a fancy residential district that promotes an amazingly healthy lifestyle. Villas for sale in Meadows are beautifully scattered along enchanting streets lined with trees. The Meadows community offers an extensive range of lifestyle amenities. The development provides access to several sports activities and recreational facilities. 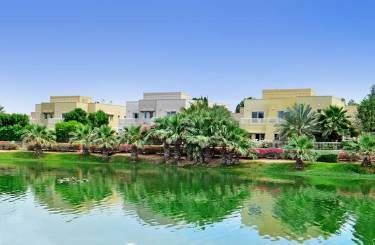 Each cluster of villas has its own amazing lake and beautifully landscaped public open spaces. There are also various and plentiful shopping and leisure facilities. These include swimming pools, children’s play area, shopping centers, cafes, and restaurants, and 24-hour security and maintenance. Meadows is considered to be one of the most desirable luxurious villa communities in Dubai. With a total of around 1500 two-story villas, the development features three-bedroom, four-bedroom, five-bedroom and six bedroom villas. The luxurious villas feature elegant finishes with ceramic tiles and marble stairs. The living areas feature 9-ft high ceilings and the fitted kitchens feature lux designer cabinetry and the spacious bedrooms have built-in wardrobes. Villas for sale in Meadows are available in 20 different architectural styles. The development comprises several clusters of villas set in distinct zones, each with a dedicated entry point. Appealing to families and professionals, as well as the large number of expat professionals looking to buy a home, Meadows villas are always a great option as the development offers a tranquil, serene lifestyle close to the activity of the urban areas in Dubai. Prices of property in Meadows vary depending on several factors: The number of rooms in a villa. The type of villa, in Meadows you will find different types for each number of rooms. The location of the villa is also an important factor in the price. And also any upgrades done to the villa influence the price. 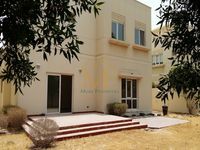 The average price for a villa in meadows can cost between 5000,000 AED and 10,000,000 AED.